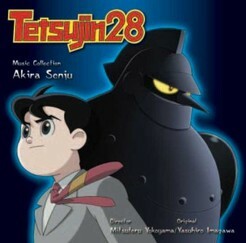 Soar on a retro-style grand, imaginative adventure with the dramatic orchestral music to the new TV anime series, Tetsujin 28! Lovingly composed by Akira Senju (Saiyuki: Requiem, Mobile Suit Victory Gundam), this 20-track CD captures and evokes the wonders of a bygone era from yesteryear, where remote controlled, jet propelled giant robots fight against crime and villains. From the nostalgic main theme song to the highly polished symphonic canvas conceived by composer Senju, this soundtrack is sure to delight both old-school anime fans of "Gigantor" and newcomers alike.